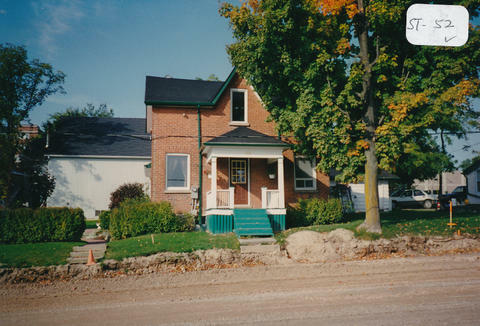 The mid-block building located at 52 Simcoe Road was built post-1900 (1902?) in the Gothic Revival Cottage style. The house, which is larger than other older cottages of a similar style in Bradford, was built on property owned by Charles Adams. Originally, there was a garden to the west and a barn on the lane. Later residents of this house included Joe Brown (a retired farmer from the 10th line) and Jessie, who lived here until he died. Joe was a noted gardener who raised his granddaughter Margaret Turner. Paul Margetiak and his wife and son also lived here at one time. He was a gardener, too, and he built a garage on the property. Len Saint did the cement work and added a closed-in porch. Eventually the property was bought by Gary Swagerman. He lived in the house with his wife and family and eventually had the barn remodelled to become the site of a dry cleaner. The garden was paved and used as a parking lot for the business.